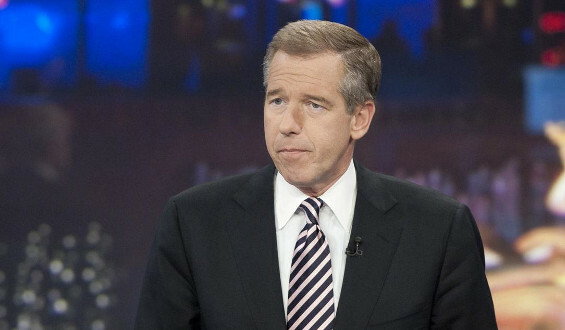 NBC Nightly News/Rock Center anchor Brian Williams, host of Education Nation Week, September 4, 2012. (http://educationnews.org). This weekend, for the third year in a row, NBC will kick off their Education Nation Week in New York City. It will involve MSNBC’s rising stars like Melissa Harris-Perry, Chuck Todd and Alex Wagner. It will include a two-day summit broken down into a series of case studies about the various issues in K-12 education and how to improve it for America’s children. It will also include a teacher town hall and a student town hall. In the end, it will all be a staged pageant of concern about kids, a subliminal message of corporatized education reform, a series of half-baked ideas that wouldn’t have been good for schools a hundred years ago, much less now. I don’t normally trash events before they begin, but I’ve seen this movie before. It’s the one that’s been given a bad title, a poor script worked on by five writers, with poor character development, mediocre actors and a wholly implausible ending. 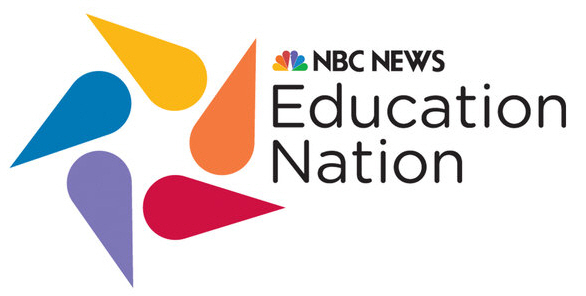 NBC News Education Nation logo, March 10, 2012. 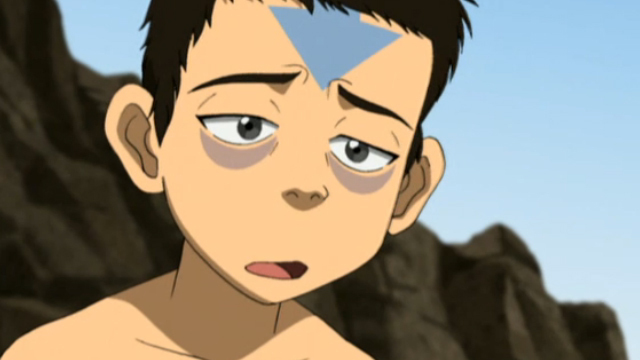 (http://mediabistro.com). NBC’s Education Nation Week fits all of those because its hosts know about as much about the nuances of education as I do about the interactions of neutrinos with the Higgs boson particle. The week-long event is sponsored by University of Phoenix, the Bill & Melinda Gates Foundation, ExxonMobil, Target, Citi and the General Motors Foundation (the last one as a “Knowledge Partner”). Seriously? A for-profit institution with a ten (10) percent graduation rate? The biggest funder of ill-conceived education reform efforts, ones that have little chance of actually creating better conditions for teachers to effectively teach students of all stripes? Not to mention a bunch of corporations that have little incentive to reform public education for America’s low-income students in a way that would truly level the playing field? Are you kidding me? In light of the recent Chicago Teachers Union strike and the serious issues that the union, Chicago’s parents and the local (not the national) media raised about the corporate-based assumptions behind education reform, NBC’s should (but won’t) call off this year’s Education Nation Week. High-stakes testing and a concentration on teacher effectiveness as reflected by test scores is the mantra of the mainstream education reform movement these days. Along with charter schools as “choice” for low-income families, battles to weaken teacher’s unions, an insistence on STEM fields as the content-based focus of reform, and the creation of a standard curriculum that is neither standard nor a full curriculum. 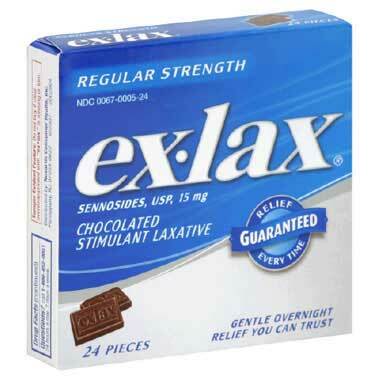 All in all, a prescription that would make the technocrats at the Gates Foundation and ExxonMobil feel better. But given the lack of funding at the state and federal level these days for everyday school needs — much less funding to implement such reforms — it simply cannot work. Without any concentration on critical thinking, writing comprehension skills, physical education, music, art, creativity, the leaders and hosts of Education Nation Week expect teachers and students to do more with less in a system that was never meant to work for most students in the first place. Harris-Perry’s all-over-the-place commentary on the CTU strike in The Nation this week is an example of media ignorance of what reforms would actually look like in the long-term, even in the case of a prominent political science professor. Her piece “Casualties in the Education Reform Wars” is based on a suffer-the-little-children (and parents) premise that demonizes all sides of the education deform battles. It shows that she has little understanding of education history, policy and politics. This is by far the most disappointing piece I’ve ever read by Harris-Perry. It’s a piece based purely on emotion, and not on the challenges that educational policy/politics have forced on teachers, administrators, students and parents. A system based on high-stakes testing and the corporatized education reform movement doesn’t work for anyone. Evaluating teachers based primarily on exams created by technocrats from afar and taken by their students means a watery gruel of education for all of our kids. Unlike Harris-Perry, cursing all sides isn’t an option for most of us. Engaging and engaged teachers, school leaders, and yes, being involved in our kids’ education is where we need to start. Holding our politicians’ feet to the fire on real education reform is another piece. And also, holding columnists’ feet to the fire when they write a piece short on facts and long on hand-wringing when writing on educational issues is something we as parents and educators must do. Especially since folks like Harris-Perry only write about these issues after a strike or a tragedy. I can guarantee, sadly, that NBC’s Education Nation Week, with the vapid thinking of thinkers like Harris-Perry involved, will be yet another media event devoid of substance and full of style points. In other words, endless drivel. The below is my response to Irvin Scott and Stacey Childress’ (of the Bill & Melinda Gates Foundation) “Response to Anthony Cody: The Role of the Marketplace in Education.” Given their corporatist, technocratic stance on education reform, I guess I should stop applying for jobs with Gates, since I don’t think they do much in the way of good work in education. The use of MLK’s “Letter From Birmingham Jail” is self-serving and sanctimonious here at best, along with the idea that charter schools are public schools, as if the two are interchangeable. King’s letter wasn’t just about the growing impatience of African Americans on the long road to equality. It’s also about how to walk the road, the tools necessary to walk the road, as well as the urgency with which we should walk the road. In my dealings with the Gates Foundation over the years as a nonprofit manager for various projects and initiatives, speed has often been more valuable than getting it right. From the first funding of community-based computer labs in libraries (like Carnegie Library of Pittsburgh) to small schools collaborations with nonprofits and NYC DOE, moving from thought to finish was typically at warp factor five or higher. Even program officers I’ve met or known at Gates have admitted over the years that not every multi-million dollar expenditure for small schools, teacher effectiveness, or teacher evaluations has come with plenty of setbacks and mistakes, as well as inconclusive or minimally positive results. To argue that charter schools are public schools is technically correct, but in practice, hardly so. Charter schools have their own boards, often do not draw their teachers from the same pool as traditional public schools, and many have selection criteria for students. Charter schools — particularly ones with higher levels of success — often have board members with deep pockets or are able to raise funds through those kinds of connections. They may have by-laws that enable them to hire non-union teachers, non-traditional teachers, even college instructors, in ways that traditional public schools simply cannot. And though the selection criteria for students varies from one charter school to the next, traditional public schools don’t have that option. Yes, we need a twenty-first century education system in the US. But we’re not going to get there with more high-stakes standardized testing, with curriculum and teacher evaluations that are tied to test scores, with the funding of every half-baked idea that has its roots in the twentieth century. Real reform requires more than smart people entrusted with a portfolio of $5 or $10 million. It comes with real cooperation with educators, a commitment to engage parents, a curriculum that is about education beyond a test, a full-fledged effort at human development, not just job training. 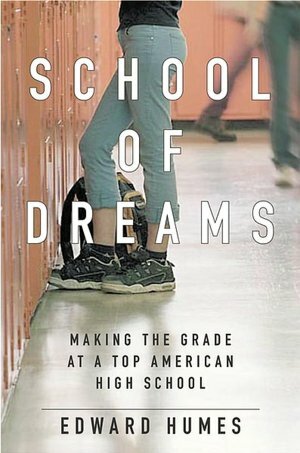 One thing that would be a place to start would be to focus on K-16 education, instead of separating the K-12 and post-secondary spheres, you know, to break free of our twentieth-century thinking about American education. 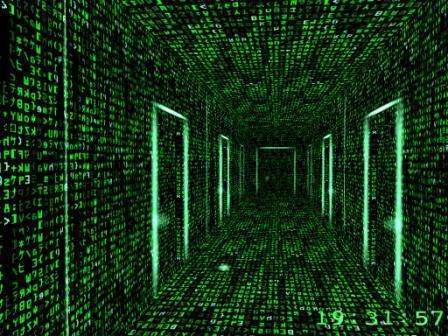 Irvin Scott and Stacey Childress should know all of this already. If they do not, shame on them for not doing the research and outreach that is a necessary part of grantmaking. However, since they do, it seems to me they need to do less defending of the Gates Foundation’s record and more work and real collaboration to move forward. “We don’t need no education” reform, so long as it continues to come out of elite money and thinking that dictates to the rest of us what reform will look like. 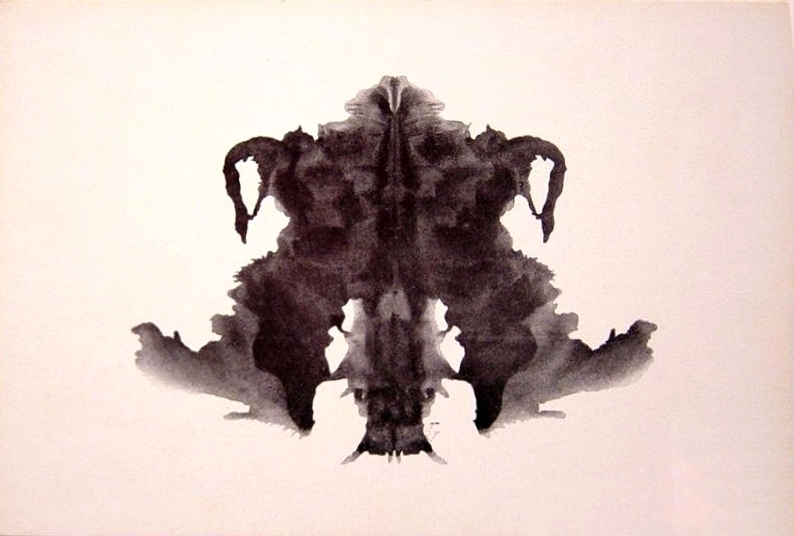 Fourth blot of the Rorschach inkblot test, 1921, February 21, 2008. (Bryan Derksen via Wikipedia). In public domain. Given that it’s the start of a new school year, and in the wake of so many shootings over the summer, it’s time to reformulate how we deal with violence and mass shootings. The saddening eruption of yet another mass shooting by former graduate student James Holmes at the The Dark Knight Rises opening in Aurora, Colorado in July is a case that makes clear my point. It’s time for colleges and universities to do psychological profiles as a requirement for admissions and attendance, and for public schools to be more proactive in providing psychological services. 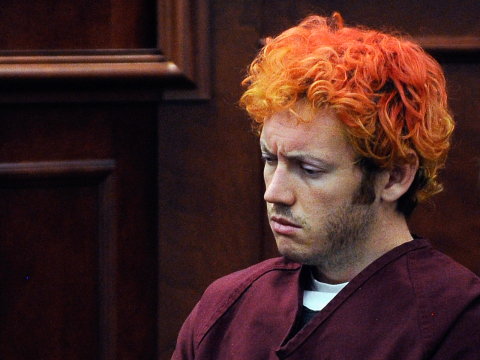 James Holmes in court in Aurora, July 23, 2012. (Peterson/AP/CBS News). There’s been much discussion of gun laws, assault weapons bans, and polls that show that a majority of Americans are anti-gun control. But there hasn’t been nearly enough dialogue about how to detect potential domestic threats to our safety to begin with. The majority of domestic threats in the past generation have come from young and mostly White males, either in high school or in higher education. We as a nation are either sympathetic — as in “how could they have turned out so wrong?” — or vengeful toward these perpetrators. We give so much thought to the Second Amendment that we completely neglect the root cause, the one thing the sympathetic and the vengeful do agree on. That someone like James Holmes would have to be psychologically unstable or “crazy” to do what he did. The list of school and college-related mass murders and shootings goes something like this since 1996. San Diego State University, Pearl, Mississippi, West Paducah, Kentucky, Jonesboro, Arkansas, Littleton, Colorado, University of Arkansas, University of Arizona School of Nursing, Virginia Tech (twice, in 2007 and 2011), Chardon, Ohio and Oikos University. Though Holmes technically didn’t unload his 100 or so bullets on a college, high school or middle school campus, he lived in the Aurora, Colorado community in part because he was a one-time University of Colorado graduate student. It’s beyond time for schools and especially colleges and universities to remember that they are very much a part of communities, not just gigantic entities unto themselves. Part of the responsibility of being a significant member of a community is to play a significant role in ensuring the safety of the community. Not just on the actual middle school, high school or a higher education institution campus, but in the surrounding community as well. Part of taking all necessary actions to ensure the safety of students, teachers, professors, administrators and community members is providing services that could identify behavioral or psychological issues among students. We’ve learned in the cases of Eric Harris and Dylan Klebold — the Columbine High School shooters — and in the case of Seung-Hui Cho — the Virginia Tech shooter — that consistent psychological services may have prevented these murders and injuries. Had psychological screening been performed and other related steps — including barring these individuals from contact with the campus and reporting potential threats to law enforcement — these students might well have become productive citizens. 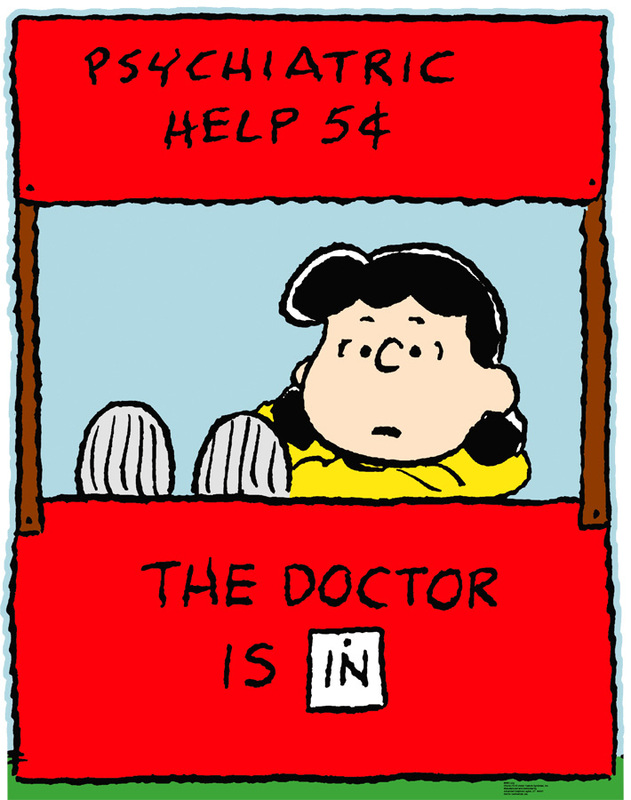 Peanuts’ Lucy Van Pelt as psychiatrist, September 12, 2012. (http://digitalcitizen.ca). 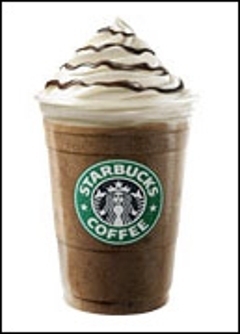 Qualifies as fair use under US Copyright laws due to blog post’s subject matter. Of course, there’s no way to know for sure if readily available psychological services at the K-12 level and required screenings at the college level would lead to a reduction in student-related mass shootings. But it would allow for the opportunity for students at an early age to discuss their delusions of grandeur, their feelings of isolation or ostracism, their rage and their need to strike out against fellow students and community members alike. It would give colleges and universities the opportunity to truly get to know potential students beyond their grades and community service opportunities, and to understand how first-year students respond to stresses and pressures of college long before they become a threat. Most importantly, mental health screening would allow a college or university to identify psychological issues with a students before accepting them into their institutions. While this proscription may make university administrators and school district superintendents squeamish, it is certainly a conversation worth having. After all, it’s not as if the debate about gun control has gotten any of us anywhere in the past 50 years. While I know that our electorate’s divided and our politics typically not representative of ordinary Americans, Mitt Romney’s and Paul Ryan’s screw-ups the past two days deserve a moment of hilarity. With all undue respect to the mainstream media, whose understanding of education reform begins and ends with political optics and charter schools, there are 400,000 reasons for 30,000 Chicago teachers to strike. Corporatized education, with longer hours, less pay and benefits, high-stakes testing and the “teacher effectiveness” mantra. Given the state of K-12 education in Chicago and elsewhere, striking to save it from the money of the Bill & Melinda Gates Foundation and the politics of Arne Duncan and Rahm Emanuel might be the trick. But I think I have a better idea, both politically and in terms of making the lazy-thinking, grossly unknowledgeable media really look at top-down corporate education reform seriously. 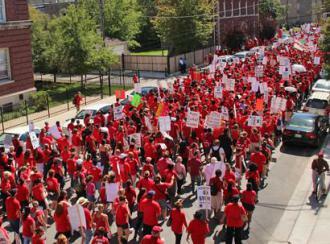 A teacher sit-in, one in which all 30,000 teachers and staff in Chicago report for the first day of school, shut out the central office, and occupy the schools to get serious negotiations and some efforts at real reform underway. The great thing about a sit-in is that while it may well be illegal, it would also get the attention even of the idiots who want to rid the country of all unions. It would be a protest that would force the media to get into the weeds of what real education reform means. It would put pressure on our idiot politicians to work with — rather than force-feed — teachers and teacher’s unions. Hopefully a major teacher’s union will do this soon. A strike, though necessary, is simply not enough.